August 21 - Saint Pius X, Pope - Memorial - My Catholic Life! In the long span of three hundred and forty years between the death of Pope Saint Pius V in 1572 and today’s pope-saint, who died in 1914, not one pope is a canonized saint. It is a sign of the Church’s solid foundations and rock-like durability that less than holy men have normally led her, and still she has thrived. Analogous to the doctrine of ex opere operato, which holds that the grace of a sacrament is effected by merely being performed, headship of the universal Church may be exercised well by intelligent men who care for her good, even if they are not personally holy. But that a pope be holy makes the Church even more impressive, in the same way that a priest’s holiness doesn’t make a sacrament more a sacrament but does make it more fruitful. 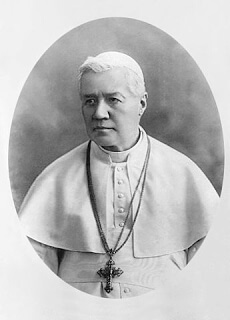 Pope Saint Pius X was born Giuseppe Sarto in northern Italy to humble parents in a poor home, the second of ten children. He entered the seminary as an adolescent and was ordained a priest at the young age of twenty-three. He served for many years in parishes and seminaries before being made a bishop and then a Cardinal. His life experience in the Church was almost exclusively pastoral, that is, concerned with the care of souls. He was not a university professor, Vatican diplomat, scholar, or ecclesiastical bureaucrat. He was the only Pope of the twentieth century without a doctorate degree. He was a parish priest, confessor, spiritual director, and boots-on-the-ground diocesan bishop. His rural background and forthright view of the faith lent Pius a common touch, which sympathized with the faith of the “everyman” who filled the pews on Sunday morning. But Pius’ past limited him somewhat as well. In his desire to protect the faithful from error like a good father protects his children, he could be overly suspicious of, and reactionary toward, a great deal of theological scholarship that would later be absorbed into the universal body of Christ at the Second Vatican Council. Pius X made changes to the church’s liturgical and sacramental life that proved to be enduring and popular. He lowered the age of First Holy Communion from twelve to seven and encouraged frequent reception of Holy Communion instead of the once-a-year, Easter duty reception that was then typical. Pius simplified the Breviary, the book of Psalms that priests and nuns pray every day, encouraged the use of Gregorian chant at Mass, and mandated that the Confraternity of Christian Doctrine (CCD) be present in every parish in the world to teach catechism to children. He also began the enormous process of gathering and synthesizing the Church’s entire body of law into an easy to handle Code of Canon Law in 1917. Pius reacted strongly and negatively toward various schools of theological scholarship he lumped under the imprecise title of “Modernism.” Pius was intransigent and relentless in weeding out from the garden of the Church all those with non-scholastic methods and conclusions in philosophy and theology. That is, he distrusted research and teaching not rooted in the approach of Saint Thomas Aquinas and similar medieval thinkers. The “Modernist” approach to ancient texts, language studies, scriptural analysis, church history, comparative theology, etc… would eventually become standard in Catholicism. But it took many decades for these more critical approaches to merge with theological orthodoxy, deep spirituality, and fidelity to Rome in a powerful synthesis at Vatican II and beyond. Saint Pius X stayed humble and poor his entire life. He was embarrassed by the pomp of papal ceremonies but nonetheless understood their significance to the faithful. Three of his unmarried sisters lived in near poverty on the outskirts of Rome while he reigned as Pope. He could have, but did not, favor them with titles or other privileges to ease their burdens. Pius died the same month as the guns of August roared a start to World War I. His death resulted partly from a deep melancholy that Christian Europe had once again devolved into such conflict. He was canonized in 1954. Pope Saint Pius X, your doctrinal fidelity, Eucharistic piety, and devotion to Mary were exemplary. May your simplicity of life, common touch, and bravery in fighting the enemies of the Church inspire all who lead the Body of Christ on earth in whatever capacity.